Stephen Harris, the chef owner of The Sportsman in Seasalter, Kent (one of my favourite places to eat), leaves rhubarb and sugar together to macerate when he is making his amazing rhubarb sorbet. It is an excellent way of drawing the juice and flavour from the rhubarb, so I have used the method here. You don’t have to make this with rose and cardamom, you can follow the recipe but flavour with fresh root ginger, orange or elderflower, or make plain rhubarb jam. Trim the rhubarb and cut into 2cm (¾in) lengths. Put it into a preserving pan, layering it up with sugar as you go. Pour over the lemon and apple juices, cover with a clean tea towel and leave overnight. The juices from the rhubarb will be drawn out. Add the cardamom to the rhubarb. Slowly bring the contents of the pan to a boil, stirring a little (but be careful not to break the rhubarb pieces up too much), skimming off any scum that rises. After boiling for about five minutes, check the temperature with a sugar thermometer and test for a set . When the jam has reached setting point, take it from the heat and add the rose water. Return it to the heat and bring to setting point again. Taste the jam. You may want to add a little more rose water, or some lemon for freshness. Pot in warm, dry sterilized jars, cover with waxed paper discs and seal. This keeps for a year; refrigerate once opened. This is not a firm set, so you can use it for puddings. 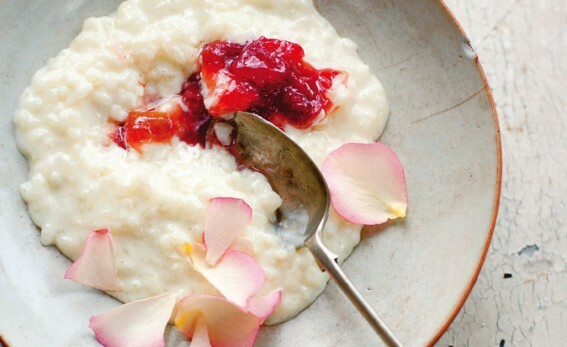 I love it with Greek yogurt (the meeting of two mouth-puckering foods), or rice pudding. You can also use it, with mascarpone, to fill a cake.